Precisely determining the beginning and end of Ramaḍān is very important because it indicates when to start and stop fasting. Therefore, it is an obligation on the Muslim community to ensure that this is determined accurately and publicized sufficiently. The Islamic lunar calendar consists of twelve months, with Ramadan being the ninth month. Each month lasts twenty-nine or thirty days. Six months will be twenty-nine days and another six will be thirty days, thus making 354 days per lunar year. The way this was calculated during the time of the Prophet Muhammad was that people would look at the sky at the beginning of every lunar month. If the new crescent was sighted, it would mean the next month has begun and the previous one has ended. The crescent is the sunlit portion of the moon as seen from Earth and varies according to the changing positions of the Sun, Moon, and Earth. 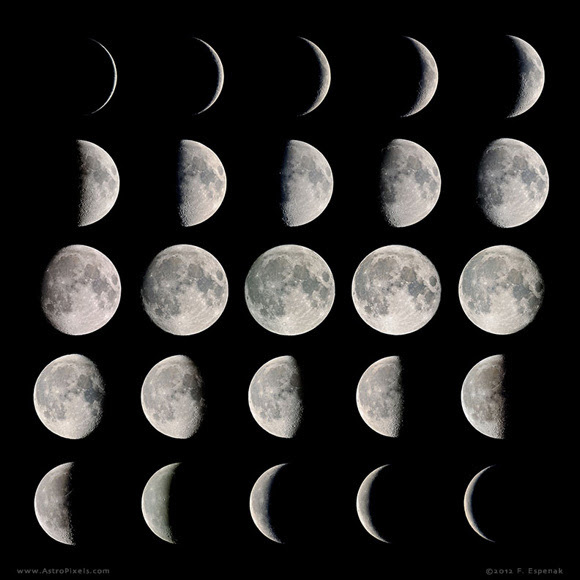 The chart below shows what the moon looks like at the beginning [thin crescent], middle [full moon], and end [thin crescent] of the lunar month. Since each month could only consist of twenty-nine or thirty days, Muslims would go outside on the twenty-ninth day of Shaʿbān [which is the 8th month in the calendar] after sunset to look for the new crescent in the sky. If the new moon crescent was seen by people sometime during the night, it would mean that the month of Shaʿbān was twenty-nine days and now the month of Ramaḍān has entered. However, if it is not visible it means that the month of Shaʿbān consists of thirty days and Ramaḍān will begin the following day. The end of the month is determined in the same way by establishing that the new moon crescent is visible on the twenty-ninth of Ramadan after sunset. If it is then Ramaḍān will consist of only twenty-nine days and the following day is the month of Shawwāl, which is Eid. However, if it is not visible it means that the month of Ramaḍān consists of thirty days and the month of Shawwāl will begin the following day. The Prophet instructed his Companions to follow this method when he said: “Start fasting when you see it [i.e. the crescent] and stop fasting [i.e. Ramaḍān is over] when you see it. If the sky is cloudy [and you can’t see the crescent on the 29th] then consider Shaʿbān as thirty days.” It should be clear from this that months in the Islamic calendar were not known in advance whether they would consist of twenty-nine or thirty days. As communications in the Muslim community became more complex, there was a need to have predetermined months for scheduling purposes. It would be very inconvenient for people in the same region to be using different calendars. Since the visibility of the crescent was not predictable in advance, another method would have to be used. One such method was the new moon conjunction, which, in astronomical terms, is when the moon is precisely between the Earth and Sun. 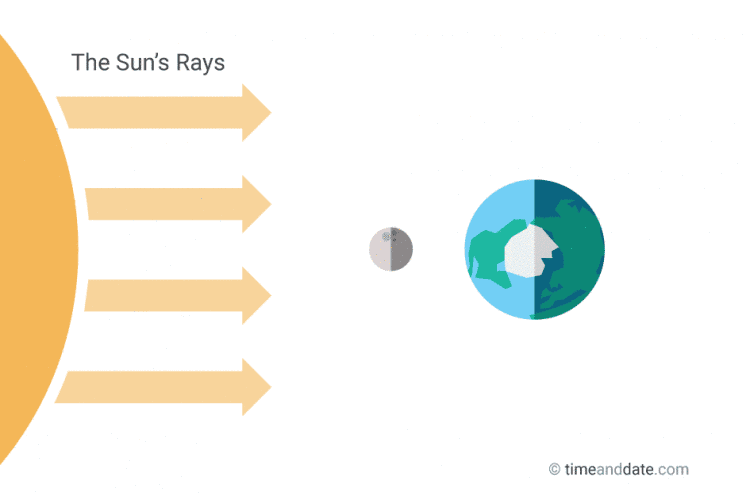 During conjunction [which is also known as moon-birth] the moon is not visible from Earth because the sunlit portion of the moon is facing away from the Earth, as seen in the figure below. New moon conjunction is precisely predictable and can be calculated exactly. The crescent moon only becomes visible from Earth about a day or two after the new moon conjunction because even when the three celestial bodies are not in a straight line, the moon is still too close to the sun’s glare to be seen with the naked eye from Earth. It is important to understand that the moon is ‘born’ about one or two days before it is actually visible, so moon-birth and moon-visibility are two entirely different things. Another method which was adopted in 1420 AH/1999 CE by the Ummul Qura calendar in Arabia was that if moonset occurs after sunset in Makkah on the 29th day of any month, then the month is over. This calculation is also precisely deterministic and took into consideration a time that is closer to the visibility of the moon than conjunction. The Fiqh Council of North America [FCNA] and the European Council for Fatwa and Research [ECFR] have adopted a similar approach where the presence of the moon above the horizon at sunset anywhere on the globe is the criteria. This is precisely determined when the elongation of the moon is at least eight degrees and it is at least five degrees above the horizon. As can be seen, even predetermined calendars which are calculated according to precise measurements require some specific methodology, such as conjunction, moonset-after-sunset, or some other precise measurements. The differing methodologies will result in different calculated calendars. The question arose among Muslim scholars: should Ramadan, and other religious days of fasting/celebration such as the 10th of Muharram [ʿĀshūrā’] and the 10th of Dhul Ḥijjah [Eid al-Aḍḥā], be determined through actual crescent sightings or a predetermined calendar? Several scholars argued that dates which have a religious significance should be determined through actual crescent sightings, the way the Prophet Muhammad did, and the calculated calendar can be used for civil purposes. Other scholars posited that a calculated calendar should be used for both civil and religious dates, the same way that it is used by most urban Muslims throughout the world for their prayer times, without having to actually check the light in the horizon for Fajr or the shadow-length for ʿAsr. In 1939, Egypt announced Eid al-Aḍḥā to be on Monday, Saudi Arabia announced it for Tuesday, and India determined it to be on Wednesday. This is common almost every year. How could there be three different dates? There are several variables which result in different conclusions about when the lunar month should begin and end. Understanding these differences will help a person understand why the issue is not as simplistic as it seems. Global Sighting vs Local Sighting: If one region in the world sees the crescent but the other does not, should they adopt the same date or a different date? Muslim scholars have disagreed over this issue because it was not directly addressed by the Prophet. In the past, one city like Makkah may sight the crescent but the Muslims in Damascus do not. News about the sighting would take a long time to travel, and the people of Damascus would have already skipped the first day of fasting, assuming that Ramaḍān had not begun yet. Therefore, in the past, some Muslim communities would begin and end Ramaḍān on different days. With the advent of modern communications, it seems that this issue has been resolved because one region can instantaneously send a message to another region about purported sightings. Nonetheless, it remains a variable which influences the date of Ramaḍān. Rejection of Witnesses: If a person reports that they saw the new crescent, but no one else did, should that person’s testimony be accepted? Does there need to be more than one witness? What if the person is known to be dishonest or has a bad memory? What if they claimed to see the moon but it was almost impossible for them to actually see it? To what extent should their report be scrutinized? These questions, and others, concerning the testimony of witnesses results in different conclusions. One group may accept the testimony of a witness and declare the start of Ramadan, while another may reject it. Usage of Technology: Should high powered telescopes or other technology be used to sight the new crescent, even if it cannot be seen with the naked eye? If so, how many of them should be deployed in each region of the world to ensure a proper sighting? Usage of such technology would potentially ensure an earlier start date, but would also be very costly and difficult to implement. Potential Visibility or Actual Sighting: If it is known that the crescent is visible in a particular area, but no one actually goes out to sight it, for whatever reason, should it be taken into consideration? If high-tech internet-enabled telescopes were set up in different parts of the world and Muslims had the ability to stream the video from those devices, would this count as a sighting? Accuracy of Visibility Calculations: Astronomers have developed maps to predict when and where the crescent is likely to be viewable on any given date. However, there is more than one way of determining this: see here, here, and here for some examples. How accurate are these calculations? Should we use these approximations to discredit witnesses who claimed they saw the crescent even though it was difficult or almost impossible to do so? These are some of the variables encountered when attempting to determine the beginning of a month in the lunar calendar and should help explain why people arrive at different conclusions. It may sound ideal to try to unite the entire world upon one date, but given the host of variables involved in the process, it is unlikely to happen anytime soon. Since some aspects of determining the new month were left vague by the Prophet, people will naturally differ in trying to interpret what Allah and His Messenger really intended. Therefore, I believe that trying to achieve local unity is more important, and should be the priority of our efforts. If two neighboring countries were to observe Ramadan on different days, it would be less impactful than two neighboring cities determining the month differently. Likewise, two neighboring cities disagreeing would have less consequences than people in the same city, or the same mosque, or even in the same household beginning and ending Ramadan on different days. The issue boils down to respect for authority. In the absence of any central authority within a locality, whether it be a city, state, or country, any Muslim is free to adopt whatever criteria they want. Muslims, in any locality, must have leaders who are willing to come together and agree on one criteria to adopt, even if they do not agree it is the ideal or most correct method. This is the first step. The next step would be to ensure that the Muslims respect the decision of those leaders and agree to follow it, even if they are not convinced it is the most accurate method. Until this occurs, Muslims may find peace in knowing that no calendar in the world is absolute, that the Prophet took into consideration foggy evenings when the crescent is not visible, and that God will judge us according to our intentions and efforts. Technically, the lunar year consists of 354.37 days while the mean time between new moons is 29.53 days. See http://www.islamicmoon.com/moonsighting%20ummal-qura%20calendar.htm, last accessed 5-24-17. See http://fiqhcouncil.org/node/83, last accessed 5-25-17. See https://eclipse.gsfc.nasa.gov/SEhelp/calendars.html, last accessed 5-25-17.